Anyone ever baked a spray poly finish to cure it? I feel a little odd for even suggesting this for fear it will ruin my project, but has anyone ever tried to speed up the cure process of water based polyurethane spray finishes in the oven? I've been working on some Heliums and a Voxel subwoofer and my last coat of polyurethane went on WAAAY too thick. It was a new can of spray, but maybe it aspired to be a fire hose instead of a rattle can when it grew up?? That was my last planned layer of poly, and it has all kinds of runs in it now. I need to sand it back and re-apply, but I can't do that until the first layers of poly are cured and pass the fingernail test. I've got a small heater fan sweeping across the worst offender, and another fan sweeping all the pieces to encourage airflow... but I'm not convinced this is shortening my timescale all that much. 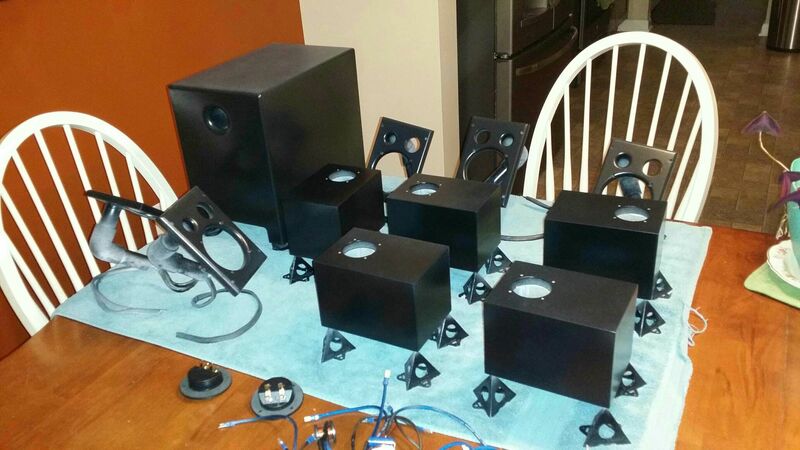 I was wondering if anyone had tried to bake a speaker project to speed up the cure time? There's some PVC port pieces in these projects that would limit my temperature to ~125 deg F to avoid softening the PVC pipes. The datasheet for the Varathane water based spray poly says its "dry heat resistance" is 212 deg F. This makes me think I should be safe from a flammable vapors perspective. Anyone have any outside the box ideas besides going inside the box (oven ) with the cabinets? My best advice is to wait and not try to force it. My better senses tell me to wait it out as well, but all I can find is "dry time," not "cure time." A bit of googling seems to say I may be waiting for 3+ weeks to deal with this ridiculous blunder. I probably don't want to see my electric bill if I tried to run that space heater for weeks on end! Thanks for the response! You could put the space heater in a make shift tent with the cabinets so you are only heating a small area. You will also need a way for air to vent through the tent, I would keep the heat on low. Make sure the heater is not directly pointed at the boxes because you want a even heat source. I would keep the heat in range of what the finish could see in a warm climate. Ouch! Sorry to see you're getting your rear end kicked on the finish Keith. I like Ken's idea if you have a safe place to do it (garage, shed). Circulation would help, add a fan with the heater to keep the air moving around. Good luck man! BTW, couldn't help but laugh at your first picture. Most of us have been there and understand your frustration. Let's hope the moderator has a good sense of humor as well. Put them in the utility room with the furnace ... were it's always warmer in the cold weather. Good ideas, Ken. I actually have a tent space set up in the garage, but it was for painting. I'd be surprised if my little personal space heater could overcome the Indiana cold right now. BTW, couldn't help but laugh at your first picture. I still have a good laugh when I see it too. If I can't laugh at it, it's become work instead of fun! Since you mentioned it, I had to check... our utility room is actually the same temp as the rest of the house. Guess we haven't developed any leaks in the piping yet! At the moment, I just have everything set up on the kitchen table with one heater fan and one regular fan sweeping over the cabinets. It's now been 24 hours since the COAT OF DOOM was unleashed, and I *think* things are starting to solidify ever so slightly. Maybe another night with the heater sweeping will do some good. Fingers crossed! Heat lamp might work well, it should heat the surface. You must have laid that on thicker than a barfly's pickup line at 2AM. Water based poly usually dries almost as fast as you can apply it. Keith- you're a fellow Hoosier? Whereabouts might you be? Hey Ben (not that we've been personally introduced or anything...) I'm a transplanted Kentucky boy living in Columbus, IN. Most people drive by the town without a second glance from I-65, but it's situated ~1 hour south of Indianapolis on I-65. Exit 68. I'm up in the northeastern corner, just north of Ft Wayne. There are quite a few of us in the state, as well as adjacent states. Just to inform you, there is an event in Ft. Wayne every Spring around April. We'd love to meet you at InDIYana 2017.